Winner of La Presse’s Most beautiful village in Quebec contest in 2012, Ville-Marie impresses with its majestic lake and beautiful landscapes. Prenez un nouveau cap, Ville-Marie sur le Lac. (Change course, Ville-Marie on the Lake.) Here is the slogan of the oldest town of the region. Erected directly on the shores of Lake Témiscamingue, Ville-Marie bathes in a unique atmosphere of calm and relaxation, so conducive to vacationing. Walk around the streets and discover century-old Victorian houses, a former stone-built agricultural school, and an old town of Boomtown-style facades. A short distance from downtown, the parc du Centenaire, starting point of La Route verte, offers a breath-taking view of the lake. It is the prime animation site of the numerous festive and cultural events that set the tempo for a lively tourist season. In the summertime, an art performance is given on Sunday afternoons. 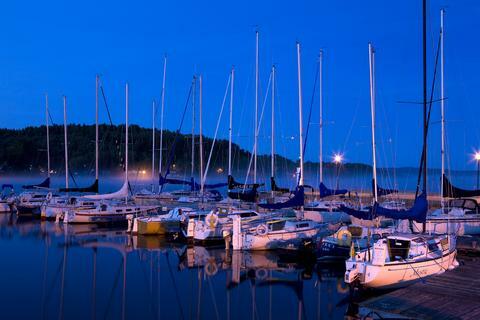 Nearby, the municipal marina offers various services to the boaters and tourists who want to enjoy the sites.